Samsung is working on new smart headsets that are more like your personal assistant. The wireless headsets, which work on your word of command , stay in touch with your Smartphone and other gadgets to keep you updated right on the move. What if a headset reads news for you? Or help you navigate while driving? It might sound weird but, this headset that works on the command of your voice has something that makes you think. Samsung, of late, has filed a patent for new fascinating smart headsets that is a kind of your personal assistance. It can keep you updated with news, traffic status and navigation, social feeds, and etc. without bothering you of taking your Smartphone out of the pocket. You can say “Read me some New York times headlines”, and it will serve you with latest news. Your favorite music, latest weather updates, triggering a call etc., will just be a voice command away. That’s not all, the smart headset by Samsung allows you to even control your car (not drive actually). Unlocking the car or igniting its engine will just be a voice command away, reads one embodiment of the patent. Likewise, you can connect it with your Smart TV to control volume or change channels. 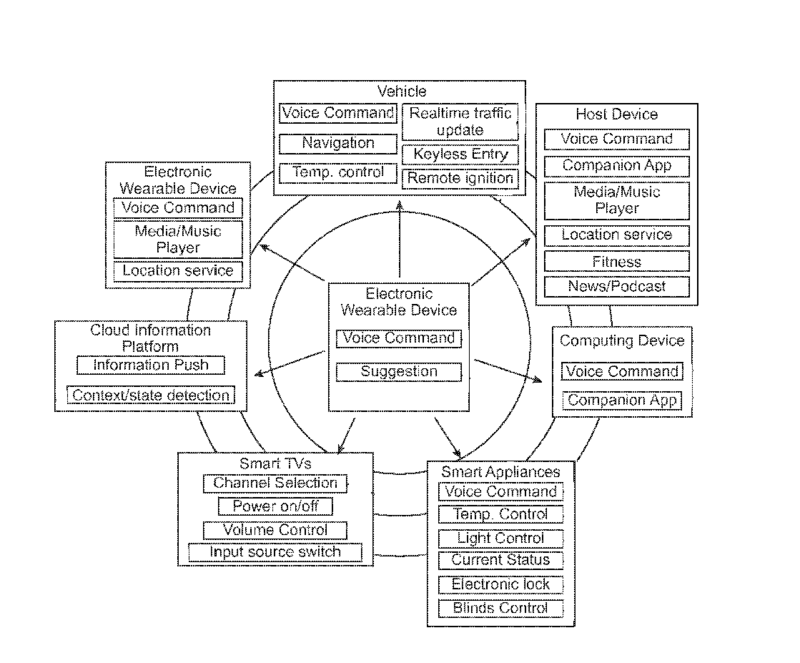 You can have a look at the patent image below that depicts what functions can be controlled through this smart wearable device of Samsung. The Smart headsets by Samsung will use Bluetooth or Wi-Fi to stay connected with your gadgets. It will come with an app that will help it do all the smart work for you. The app will work like your personal assistant and a processor for your headsets. Every time you speak a command, it will be routed to the app that will process it and return with the results (if available). The headsets have sensors which allow them to determine their physical state and to sense whether they are in your ear or hanging by your neck. This makes the notification delivery smart as you aren’t going to receive audio notification if the headsets are not in your ears. Not only this, the app also figures out the best way to relay a notification. For example, if they are not in your ears, the app will send the notification on your smartwatch, tablet or whatever seems best to it at that time. There will be a notification button on the headsets. When you receive a notification or any alert, the headsets will play a tone. And to listen to it, all you have to do is to long press the notification button. The patent mentions to set different alert tones for different notification; for example, you can set two different tones for news alerts and incoming texts. This feature will let you know the kind of alert that is coming by. Guess what? You don’t have to worry about missing an important call or an email while you are trying to be a frogman in the pool or basking on the beach. The wireless headsets are waterproof also. Though the headsets could be overpriced; but, with their own unique features, no doubt, these smart headsets by Samsung could set themselves among the league of best wearable devices in future. Interesting read. So these headsets will get people completely gadgetized. (not sure if there is a word like that) but its like syncing the brain with the gadget. Yeah it will make us completely digitized and will serve as a personal assistance. And the future that will have IoT such gadgets will become commonplace. Thank for stopping by. Glad that you liked it.